^ a b c d e f Wurchterl, G. (2004). "Planet Formation". In P. Ehrenfreund; et al. (eds.). Planet Formation Towards Estimating Galactic Habitability. Astrobiology:Future Perspectives. Astrophysics and Space Science Library. Kluwer Academic Publishers. pp. 67–96. doi:10.1007/1-4020-2305-7. ISBN 9781402023040. ^ Dullemond, C.; Hollenbach, D.; Kamp, I.; D'Alessio, P. (2007). "Models of the Structure and Evolution of Protoplanetary Disks". In Reipurth, B.; Jewitt, D.; Keil, K. (eds.). Protostars and Planets V. Protostars and Planets V. Tucson, AZ: University of Arizona Press. pp. 555–572. arXiv:astro-ph/0602619. Bibcode:2007prpl.conf..555D. ISBN 978-0816526543. ^ Clarke, C. (2011). 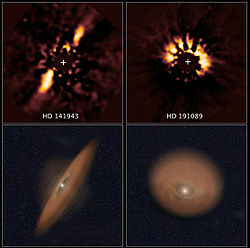 "The Dispersal of Disks around Young Stars". In Garcia, P. (ed.). Physical Processes in Circumstellar Disks around Young Stars. Chicago, IL: University of Chicago Press. pp. 355–418. ISBN 9780226282282. ^ a b c d D'Angelo, G.; Durisen, R. H.; Lissauer, J. J. (2011). "Giant Planet Formation". In S. Seager. (ed.). Exoplanets. University of Arizona Press, Tucson, AZ. pp. 319–346. arXiv:1006.5486. Bibcode:2010exop.book..319D. ^ Johansen, A.; Blum, J.; Tanaka, H.; Ormel, C.; Bizzarro, M.; Rickman, H. (2014). "The Multifaceted Planetesimal Formation Process". In Beuther, H.; Klessen, R. S.; Dullemond, C. P.; Henning, T. (eds.). 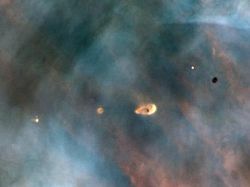 Protostars and Planets VI. Protostars and Planets Vi. University of Arizona Press. pp. 547–570. arXiv:1402.1344. Bibcode:2014prpl.conf..547J. doi:10.2458/azu_uapress_9780816531240-ch024. ISBN 978-0-8165-3124-0. ^ Johansen, A.; Jacquet, E.; Cuzzi, J. N.; Morbidelli, A.; Gounelle, M. (2015). 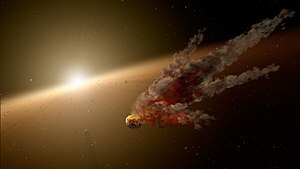 "New Paradigms For Asteroid Formation". In Michel, P.; DeMeo, F.; Bottke, W. (eds.). Asteroids IV. Space Science Series. University of Arizona Press. p. 471. arXiv:1505.02941. Bibcode:2015aste.book..471J. doi:10.2458/azu_uapress_9780816532131-ch025. ISBN 978-0-8165-3213-1. ^ a b D'Angelo, G.; Lissauer, J. J. (2018). 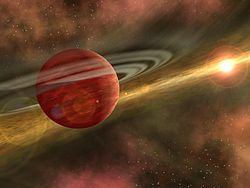 "Formation of Giant Planets". In Deeg H., Belmonte J. (ed.). Handbook of Exoplanets. Springer International Publishing AG, part of Springer Nature. pp. 2319–2343. arXiv:1806.05649. Bibcode:2018haex.bookE.140D. doi:10.1007/978-3-319-55333-7_140. ISBN 978-3-319-55332-0. ^ a b c Papaloizou, J. C. B.; Nelson, R. P.; Kley, W.; et al. (2007). "Disk-Planet Interactions During Planet Formation". In Bo Reipurth; David Jewitt; Klaus Keil (eds.). Protostars and Planets V. Arizona Press. p. 655. arXiv:astro-ph/0603196. Bibcode:2007prpl.conf..655P.